Doreen is 49 years old. She volunteers at the SHARE Food Bank. She was widowed at 36 and raised her daughter on her own. 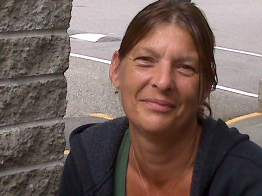 Doreen has also lived on the streets and woods of the Tri-Cities. Doreen’s story of meeting her husband at 15, marrying him by the time she was 21 and having a daughter three years later is not an unusual story – this may describe many of our relationships and lives. Doreen’s life got derailed when her husband died of a massive heart attack making her a single parent of a 12 year old in the early 90s. Doreen had little work experience and the life insurance money and widow’s pension she started receiving didn’t go very far. Doreen went on welfare for a bit which helped her go back to school and get a job for a bottle water company. During this time she had started a new relationship that was, in hindsight, not healthy. Her boyfriend introduced her to drugs and she eventually quit her job. The relationship continued to deteriorate and eventually ended but the drug use didn’t. eventually wore out her stay with friends and in 2007 found herself on our streets, broke and alone. She spent a couple of weeks walking around Poco all day long until nightfall when she would curl up on the stairs of city hall. She eventually met others making their homes on the street and learned that the bush is a better place to rest your head. Another homeless person offered her a tent and she learned about the food bank and Hope for Freedom Outreach workers and what they had to offer. She made use of the Cold wet Weather Mat Program when it was initiated in the fall 2007. By February 2008 Doreen had had enough. She could no longer keep this up. She knew she needed help and askedfor it. Hope for Freedom helped her get into a shelter, then into transitional housing and addictions counselling. She eventually got a job in a recovery house, but that didn’t work out for the long term and once again she found she was homeless. She couch surfed or took care of children in exchange for rent. She stayed with friends – who it turns out were using drugs – so Doreen got herself a tent and went back to the woods. She was outside for one night, but knew that this was no longer the life for her. She had a few dollars saved from her last pay cheque and managed to find a room for rent in Poco and between what she gets on welfare and the widow’s pension, she is able to make ends meet and stay drug free. Doreen plans to go back to school to become an addictions counselor. There are hundreds of Doreen’s in our communities. And I am here to tell you about Homelessness Action Week so that the Doreen’s who live on our streets and in our woods are no longer anonymous and that we acknowledge them as people who need our help.